An estimated 600,000 Americans suffer from PKD, which causes cysts to grow on kidneys. It is the fourth leading cause of kidney failure. About half of PKD sufferers will have kidney failure by age 60; by age 70, the odds of kidney failure jump to 60 percent. It affects both men and women of all races. During March’s National Kidney Month, Rabin will donate 10 percent of Hang-O-Matic – a popular all-in-one hanging tool sold throughout the U.S. — proceeds to PKD research. It’s a cause Rabin is all too familiar with. She and her sister both suffer from the disease, as does her cousin and his two children. Rabin’s mother and two uncles had PKD and all died within a year of each other. They had been on dialysis and were on a kidney waiting list. Rabin, a mother of two children, who’s health is yet to be determined, wants to prevent other families from heartache by helping advance PKD research. 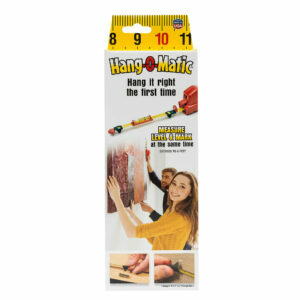 Hang-O-Matic can be found in Bed, Bath, & Beyond, Hobby Lobby, Container Store and Ace Hardware plus all the big box online stores.